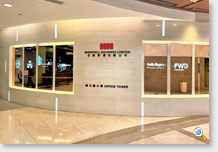 Hopewell Centre, the flagship of the Group, is situated in Wanchai with two main entrances on Queen's Road East and Kennedy Road. 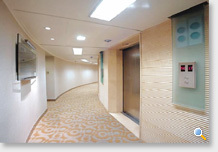 It is a 66-storey building, gross floor area of approximately 840,000 sq. ft., with office, shopping arcade and car parking facilities for tenants and visitors all under one roof. Its prestigious circular structural design provides panoramic harbour and peak views. The main features of Hopewell Centre include single office floor plate up to approximately 16,000 sq. ft. in lettable floor area and efficiency is maximized for its column free design. Copyright © 2018 Hopewell Real Estate Agency Limited. All rights reserved.